Every single safari that Go2Africa books and pays for on behalf of our clients is covered by our Supplier Default Insurance. We’ve invested in this cover to protect our clients from an unexpected cancellation that affects their vacation – specifically a cancellation resulting from a supplier becoming insolvent. This insurance is useful because suppliers provide the essential services that make up a safari itinerary: accommodation, transport and activities. 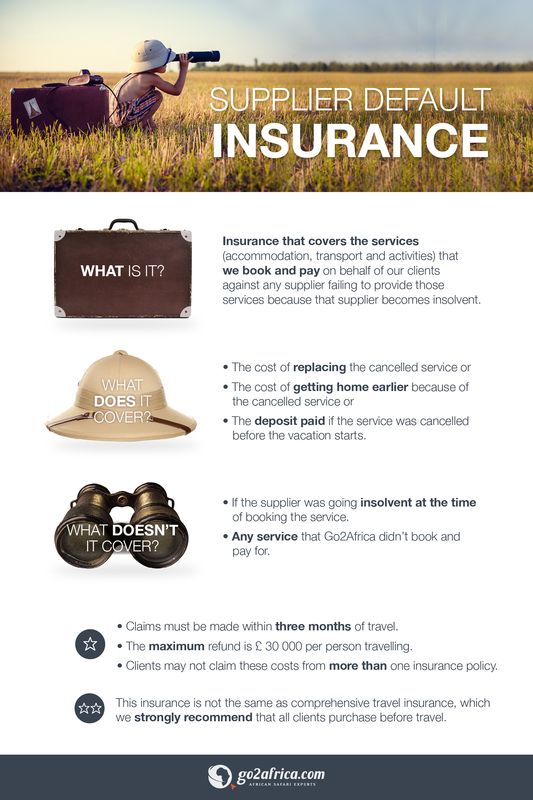 An unexpected disruption in one of these services impacts the whole vacation - our insurance is there to protect our clients from financial loss in the event of a supplier becoming insolvent. It’s insurance that covers the cost of services (accommodation, transport and activities) that Go2Africa books and pays on behalf of our clients in the event that any supplier becomes insolvent and fails to provide those services. ...than worrying about what could go wrong. The deposit you paid if the service was cancelled before your vacation started. If the supplier was going insolvent at the time of booking the service or if the service that was cancelled was not booked and paid for on your behalf by Go2Africa. Our Supplier Default Insurance is not the same thing as your comprehensive travel insurance. Our insurance is automatically included in your safari quote, but you need to purchase your travel insurance separately from an appropriate insurance provider. Go2Africa doesn’t sell insurance but we can recommend Pari Morse.